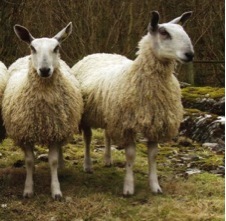 Hi, now I have introduced myself I can start to introduce you to lots of lovely wool types and breeds of sheep that we have here in the UK and show you just how they are used. Wool is used in such a wide range of products that most of us probably don’t give it a second thought but we should! Even I was a little surprised when I found out just how many breeds there are of this lovely creature right on our doorsteps. The first one I came across was The Blue Faced Leicester. Now as a child growing up if someone asked me to describe wool I would immediately think: Itchy. I’m now thinking of a knitted jumper my nana gave me that I never wore. Are you thinking of the same now? J I am sure we all have one. Trust me though this yarn is far from Itchy. I produced the whole of my women’s collection last season from this beautifully soft wool. I always encourage people to feel our products if I am at fairs and they are generally surprised at how soft the yarns are. Anyway, when I first started my business I researched lots of different yarns from here in the UK and further a field and I settled on the gorgeous Blue Faced Leicester yarn. I source mine from Yorkshire but there are many wonderful wool shops that sell it and lots of Artisan spinners and dyers too. This yarn is predominantly used for hand knitting yarns in the UK because of its beautiful softness. I mentioned about artisan spinners and dyers using this fleece a lot and whilst doing my research I found this website http://www.edencottageyarns.co.uk. The owner Victoria hand dyes all her yarns to stunning colour palettes. So I hope next time you need to buy some yarn you decide to go for a British wool such as Blue Faced Leicester as it’s much better for the environment and feels so much softer than man-made yarns. Visit http://www.samanthagrig.co.uk for more info and to purchase Sam’s lovely products! Sign up to our newsletter to find out when is Sam’s next post coming out!